If you are looking for a perfect escapade this summer season in Branson, take a fantastic train ride with Branson Scenic Railway where you will also experience exquisite dinner on board while enjoying the picturesque sceneries around the Ozark mountains. This train ride with Branson Scenic Railway gives you the most unforgettable experience as you feel the fun and excitement of train travel. Travelling in the railway not just give more fun to everyone, it is also a perfect romantic getaway for couples who want to escape from crowded city streets. With the magnificent view of the beautiful natural scenery and wildlife where the train travels around, you tend to forget the city life you left behind. Branson Scenic Railway was established during the completion of White River Railway in 1905. The construction of the railway through the rugged terrain in the wooded hills of the Ozark mountains have used 239 miles of track that cost $12 million. The city of Branson was named when Rueben S. Branson moved to the White River (now known as Lake Taneycomo) and Roark Creek. After the arrival of the railroad in 1902, the city of Branson flourished and the area became accessible to people wanted to travel by train. Train tour travel with Branson Scenic Railway was started only in 1933 where tour excursions were offered daily using commercial railroad line for its travelling tourists. In every departure, the routes of the train is determined that either go south or north. The northern route travels as far as Galena, Missouri while the southern route goes as far as Arkansas. The narrator in the train points out the communities and tells some information about it as the trail travels. As the train traverses through southwest Missouri, you will still see original tresties and tunnels. Train excursion with Branson Scenic Railway takes its passengers to the Ozark Mountains 3 to 4 times daily on a 40-mile roundtrip, touring mountainous spots inaccessible to cars. This train excursion tour takes 1 hour and 45 minutes. With the beautiful restoration of the locomotives and the rail cars to its present splendor, you will feel “first-class experience’’ in train travel. While enjoying a wonderful excursion tour with the Branson Scenic Railway, you will feel a very relaxed atmosphere as the train takes you all across the railway. This exquisite train excursion tour allows you to enjoy special moment on board as you enjoy first class dinner and served with hot cocoa along with delicious baked cookies and special souvenir mug. 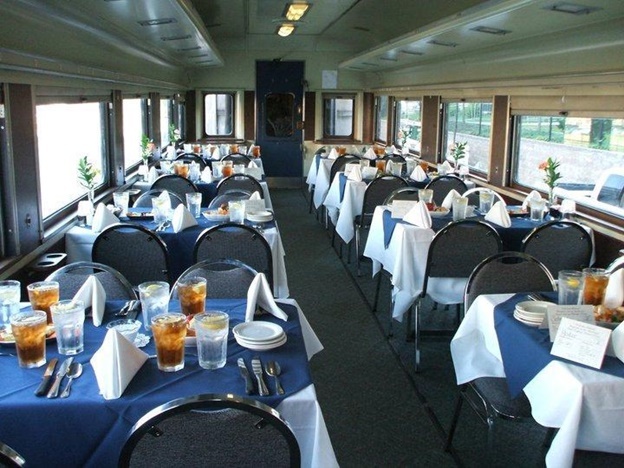 As the train travels along the rail tracks, you will be feasting with the many picturesque views of the beautiful landscape of the Ozark mountains. All along, you are sure to enjoy the fun and excitement of train travel as it heads across the downtown area where you can see many exciting attractions, entertainment shows, and more. Branson Scenic Railway offers a fantastic train ride with exquisite dinner on board while enjoying panoramic views of the Ozark mountains.